Things have been busy lately only to get busier in coming weeks and while I was sitting at home bored, I thought "What can I post today?". After I scraped a lot of ideas, I finally decided on a post that's more personal than bookish. I've been thinking lately about my future and what I want to do when I'm older. When I was little I would have instantly been sure that I wanted to pursue Singing as a career and whilst it will always be a dream of mine, I'm finding that as I change so does that answer. Call me strange but I've always been one of those teenagers eager to get themselves a job and wishing that I would be allowed to start applying sooner. Not because it mean't I was growing up but because I'm looking forward to getting paid for doing something I enjoy doing. I say this because I don't see the point in applying for a job just because it's a job, without trying to apply for something I'd actually want to do. I'm still young and just trying to get through high school but I feel as though I can only get an advantage from starting young. So what do I want to do? I want to be a book publicist. Blogging has really allowed me to have a different and deeper involvement in social media and of course as reader allowed me to share and express my love of reading as it continues to grow. It has also allowed me to get in touch with many publishing companies and review for them. I have always fancied the idea of being a organiser and promoter of sorts, organising events and spreading the love. So what better than to promote reading, something I'm mad for and suited to. I think the legal working age in Australia is 14 and a half and whilst I haven't reached that yet, I am not far from it. A few months ago I went to a bookish event and asked someone how I would go about getting a job. She told me that she was the person to talk to regarding internships and that that was the best place to start. It got me thinking about how I could start my career early instead of waiting until I am 18 and broke. The year 10's at my school have been doing work experience lately and today I had to pop in and pass along a note to our School's Career adviser. I began talking to her about my blog and she was fascinated, she told me that she wanted to have a meeting with me on monday to discuss. Shortly after that I bumped into one of the English teachers at my school who has experience in the publishing industry. We had a really interesting talk and it got me excited about what my future could be like if that's what I was to pursue. I know that I'm young and it's not an easy industry to get into but right now I'm just content with knowing that I have an idea of what I want to do and how to get there, even if this may change. There are heaps of possibilities, hopefully starting with my local bookshop and lots of internship applications. I feel excited because I know that being a book publicist is something I'm passionate about. Right now School is my priority but at least I'm at a start. I am actually really looking forward to chatting with the Careers adviser and seeing what advice she has to offer. How do you feel about the future? What are you're thoughts on this? 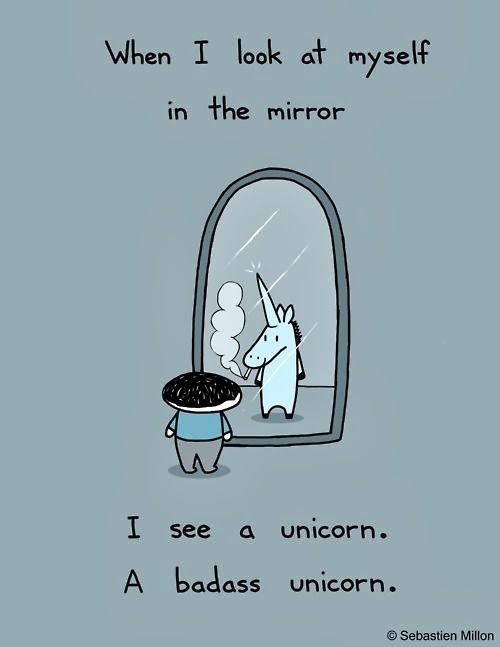 But hey if this all falls through, I could just be a unicorn! When you said this post would be different you weren't kidding. I remember when we were little and we either used to want to be a singer, dancer, model or actor. The good ole days huh! OMG I'm the same, I've been dying to get a job and recently I applied for IGA so I may have a job sooner than later! I'm excited and I hope I get it. I'm pretty sure you'll become a book publicist easily because technically blogging is already on the way there. It's good that you have an idea what you want to be! Good on you for figuring out what you want to do, and actually working toward getting experience! I wish I had your motivation. I was never sure what I wanted to do growing up through high school. My options in year 10 were either something to do with writing, or being a vet. I got the marks to get into vet but it never really hit me that it was what I really wanted to do until I started studying it. I wish I'd had the confidence to do something sooner (like volunteer in a clinic/get a vet nursing job) so I could have more experience. Anyway, WELL DONE on figuring out what you want to do and actually working towards it! I wish I'd had your motivation when I was younger, I may have had a paying job sooner and have more experience. But I was never 100% sure what I wanted to be. Even now as I study in uni to what is I think my dream career there is a little doubt as to my competency in it. I wished I'd more actively searched for experience opportunities like you are! I'm just too shy though, even now the thought of applying to places makes me really anxious. I know exactly and utterly what you mean. Since I was in Year 11, I've just wanted to get out there and start working in the book publishing industry. I am thinking of getting a job in the publishing industry like an internship when I am nearly 15, which is about 10 months away. Aw, this was such a nice (and refreshing) post. I;m happy that you have a good idea about your future. One minute I'm certain that one career is right for me and then the next minute I'm totally absorbed by another job. It's very difficult to choose! I also think blogging is a brilliant way to get to know yourself better. It certainly had helped me broaden my interests. Well maybe a bit too broad, I'm starting to get very confubled! A book publicist sounds incredibly interesting, and I think it would suit you (well, from what I gathered through your blog). Wow Sunny, how exciting it sounds like books are definitely your passion and I'm glad you've figured that out already! Good luck with getting there, you're doing all the right things already. That's just a.m.a.z.i.n.g. that you want to be a book publicist!! You will do great at that, Sunny! Loved reading this, Sunny! (Though, like Sophie also said on twitter, the title did mean you were quitting blogging at first! noo! xD) We have exactly the same idea!!! :D I was at a bookish party, and asked the same, and got the same answer, too! SNAP :D I hope all goes well! You're kinda lucky, that you get to start internships at a younger age. I' have too long to wait! hi Sunny, I've been following your blog for a while. You're lucky that you get to experiment from when you're 14. Use these years to bounce around your interests before settling on the one or two you'd love to do for a loooooong time.